VooDoo BBQ & Grill has taken one of the oldest forms of cooking and spiced it up a notch. This is not just BBQ but New Orleans-style BBQ. What does that mean? The meats are dry-rubbed with Cajun spices and slow-cooked using oak and pecan wood. Need a little more kick? Try one of their 3 BBQ sauces. Main dishes are accompanied by traditional signature side dishes worthy of a spot on a Southern table. A visit to a VooDoo BBQ & Grill takes you on a journey to New Orleans. Great food, cold drinks, and music are what you will experience at VooDoo BBQ & Grill. All locations are open for lunch and dinner. Reservations are not required. Below is the latest VooDoo BBQ & Grill menu with prices. Now, VooDoo BBQ & Grill makes it easy for you to enjoy your BBQ favorites anytime. When pressed for time, you can order VooDoo BBQ & Grill online and pick up at your convenience. Check out the special online ordering page to view menu and pick your location. The best way to make an impression at your next cook-out is to get a hold of one of VooDoo BBQ & Grill’s special sauces. It’s true voodoo magic in a bottle. Be sure to keep it a secret. Looking for a last minute gift? You can purchase a VooDoo BBQ & Grill gift card online. The traditional gift card will be sent via postal service and customized with your own personal message. You don’t need magic to decide what to eat for your next social gathering or corporate event. Let VooDoo BBQ & Grill cater it. VooDoo BBQ & Grill offers a BBQ packs & platters to VooDoo Box Lunches. Ordering is simple when you go online. Select your location, pull up the catering menu and place your order. A great way to current on all the latest happenings at VooDoo BBQ & Grill is to sign up to receive their newsletter. Sign-up is simple and quick and you will be one of the first to know about new store openings, new menu items, and the latest news. VooDoo BBQ & Grill has a presence on social media. Be sure to follow and connect with them through the various social media platforms. Turn your passion into great food and fun into a fulfilling career as part of the VooDoo Krewe. If you are high-energy, positive, and not afraid to work hard, VooDoo BBQ & Grill is the place for you. VooDoo BBQ & Grill offers many career opportunities with comprehensive benefits package. Head over to the official VooDoo BBQ & Grill website to learn more and see a list of current openings. Let the magic happen. The love for great tasting BBQ is what brought together 3 individuals; an accountant, a restaurant developer, and a restaurant manager. Together they developed a concept to offer New Orleans-style BBQ to the public. On Mardi Gras day, 2002, VooDoo BBQ & Grill was opened to standing room only diners. VooDoo BBQ & Grill began franchising in 2006 and today there are over 15 locations in Florida, Louisiana, Texas, and Indiana. 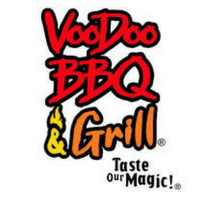 VooDoo BBQ & Grill is headquartered in Prairieville, LA. If you are interested in owning a VooDoo BBQ & Grill franchise, check out the details on their official website. If you want to learn more about VooDoo BBQ & Grill, visit their official website.